To see all the chapters and writers, click here. Previously: Sandra blames Brown for failing to stop a killing. In front of Sandra, a man in a pith helmet and darkened aviator goggles drew a large, ancient handgun from his belt and aimed it at the head of the woman beside him. He pulled the trigger. The gun clicked, and a tin fan at the barrel end spun round and gently blew the hair on the woman’s temple. The woman, perspiring from the fullness of her costume, a silk bustier on top of an ankle-length dress, turned and smiled. “Thank you, darling,” she said. 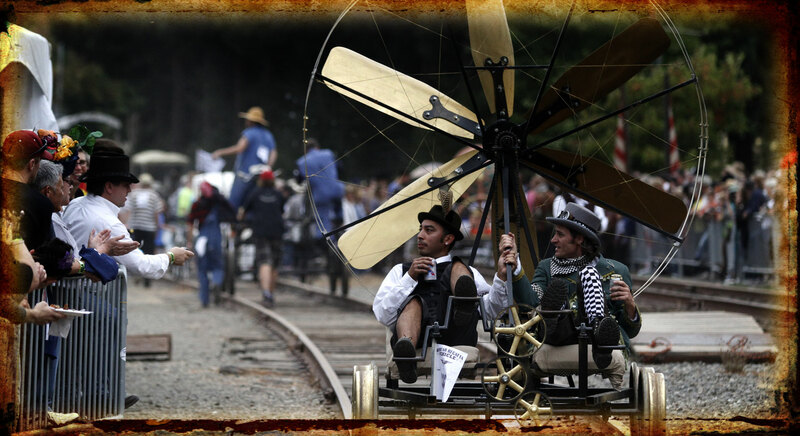 It was Sandra’s day off, and she was meeting Abby at the Handcar Regatta in Santa Rosa’s Railroad Square. Standing at the southern end of the railway station, Sandra looked across Depot Park, which was filled with hundreds of steam-punk revelers. It was a surreal scene. The costumes were Victorian: women in thigh-high stockings, leather boots, and embroidered parasols. Men in straw boaters, wing-tip collars, and Balbo whiskers. But amid the faithful reproductions lay the bizarre. A giant wind-up key protruded from a woman’s back. A mechanical owl perched on another woman’s shoulder. A man in an oilskin slicker brandished an antique blunderbuss whose barrel sprouted a ray-gun contraption. It was a historical re-creation of a history that never existed, except in a Jules Verne dream. As she watched people mill around her, Sandra felt herself swept up in the spectacle. It was as if everyone was in on a big joke, and each new outlandish thing added to the fun. For the first time in two weeks, Sandra felt herself relax. She checked the time on her cell. Abby was late. Had they mixed up the meeting place? The crowds on either side of the rails roared as pairs of competing contraptions rolled down parallel train tracks. 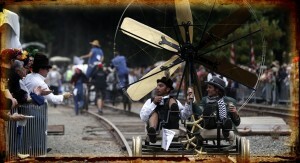 Over spectators’ heads, Sandra watched a pump trolley pass a pedal-driven handcar across the finish line. In Sandra’s first week in Santa Rosa, as part of a quick orientation, Abby had told her how the railway station was in a scene from an old Hitchcock film, when a murderous uncle, on the run from the police, arrives on a train to the safety and innocence of this small town. Sandra walked through Depot Park to Wilson Street. Her cell chimed. Abby. Finally. Turning away from a loud vendor, Sandra faced the park, and pressed the cell tight to her ear. “Surprise,” a voice said. “Me again.” It was him. “Your friend’s in a good place,” the killer said calmly. Sandra felt her hand shaking. “What do you want?” she said. Her voice cracked. Beside her, a small boy in a train conductor’s hat smiled at her. He seemed to live in a different world. Sandra squeezed her cell and took off in a half-jog east on Fourth, down the narrow sidewalk, weaving in and out of the Handcar crowd coming toward her. Old man in a brocade military uniform. Tall woman in a straw hat wrapped in silk. As she ran, she suddenly thought, Something’s wrong. What is it? She went past a family bunched in a cafe doorway. Around a sidewalk signboard. She crossed Davis, waving her hand to stop a car. Through the traffic bollards and into the cavelike darkness of the freeway overpass. At Morgan, bent over and breathing hard, she stopped for the light. Come on, she said to herself. Think. What is it? The light changed. She thought: How’d he know I needed to turn around? She punched re-dial on her cell. Detective Brown broke the plastic lid opening on his coffee and smelled the Jamaica Blue Mountain. He was parked in an unmarked car in the Barnes and Noble parking lot downtown at Third and D streets. As he sipped his coffee, he thought of Sara Flemming, the Windsor victim who was not here to see this morning. What had Cordero said that other morning? You don’t get how smart this guy is. Was she right? Was Flemming my fault? On the seat beside him, his cell sounded. Flores. “Our boy’s used the stolen cell again,” Flores said. “Cordero?” Brown asked. He stuck his cup in the console holder. Brown started the car and put it in gear. Still holding the cell with one hand, Brown pulled the car into the intersection, turned right on Third, and accelerated hard down the street. 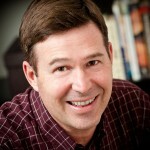 Next time (June 11): “Scared of Noise?” by Press Democrat Staff Writer/author Robert Digitale. A killer’s scheme. Frederick Weisel is the author of Teller: A Novel, a new mystery set in Sonoma County, which Kirkus Reviews describes as a “smartly written debut mystery . . . with elegant echoes of Chandler and Macdonald.” His second novel, Elise, which will be published in 2013, is a fast-paced police procedural set in Santa Rosa, and featuring police detective Eddie Mahler. 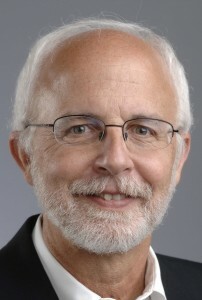 See www.frederickweisel.com for excerpts, backstory, discussion, reviews, and videos. TO SEE ALL THE SONOMA SQUARES WRITERS AND THEIR CHAPTERS, WHEN PUBLISHED, CLICK HERE.